The Blogger Conference finally happened, yes formally on August 30, 2015. It was covered by BBS and Kuensel, you see it had to be formal to be covered. We have had several Bloggers' Meets in the past, once we had 35 people attending but since it was very informal it seemed like it didn't happen. But those were the founding moments, we drafted and polished the ideas. 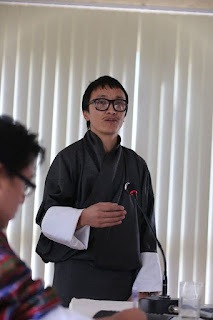 Lucky for us we had designer, artist, event manager, everyone among us who were willing to do everything for the evolving group we called Community of Bhutan Bloggers. Now that we have taken the first unsure step and enjoyed it, we are looking forward to many events. 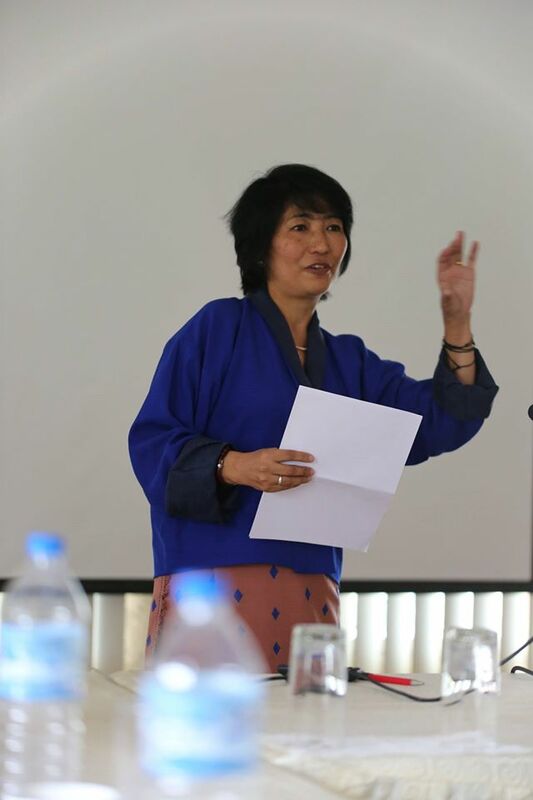 My friend Nawang Phuntsho gave the opening remark and managed the conference. First, we launched the mobile app we promised, in very casual way as I liked it to be. Not many realised we actually launched it. Thanks to my friend and friend to Bhutan, Boaz for delivering it, just like that. Anyone else would have taken fortunes out of this penniless community. We had four speakers who were given to speak for half an hour each, but they all overshot their time. But because of the variety in the topics we enjoyed each minute of their talks. Opening speaker Riku Dhan Subba took us on a journey back to his rural roots. His father owned the first radio in the village and soon the radio brought his parents together and he was born under a tree... it was inspiring to listen to a young man who would visit his village in Chuzaygang five times a year, walking the talk. 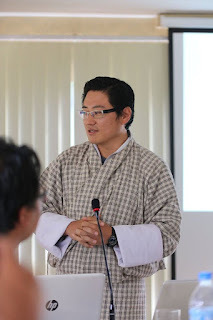 Second speaker, Member of Parliament in the National Council from Gasa Dzongkhag, Dasho Sangay Khandu educated the bloggers on the functions of the parliament, unique powers of the two houses, laws and bylaws of the parliament, roles of MPs, parliamentary committees, decision-making in the parliament, quorum of decision, voting, bills, legislative cycle, etc that each blogger must be informed. 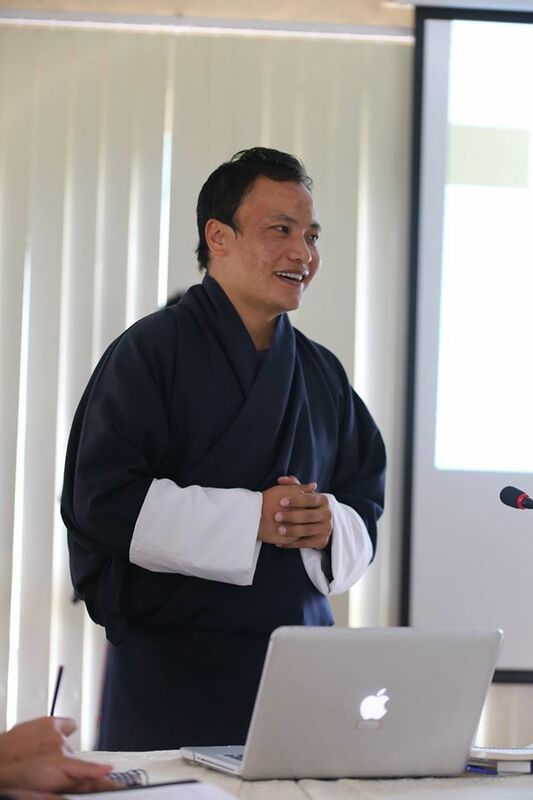 Third Speaker, Ugyen Lhendup amazed us with his research findings on Poverty and Inequality in Bhutan. Besides igniting lots of discussion on the subject he also made us rethink on a very important historical date, i.e. The First Five Year Plan, which we all know, was initiated in 1961 but Ugyen had found documents to prove that it actually began in 1953. The fourth speaker, Tshering Dolkar led us through her humble writing journey which began with scribbling in random papers to publishing in Kuensel's literary corner. Hers was a pure joy of writing without any desire to publish. He blog soon gave her a newer platform to nurture her passion for writing. She was almost flying when she read her smooth poems, written in formats that are Japanese, Korean and Chinese. The conference was planned to last till 1pm in the afternoon so I had requested for only one round of refreshment from our host Namseling Boutique Hotel but soon we realised our blunder and shamelessly asked requested for another round of refreshment. It was 3pm when we finally forced ourselves to end the conference and go looking for lunch. Our host hotel was ready to sponsor us lunch had we informed them earlier but it was our first time and we made a big miscalculation. 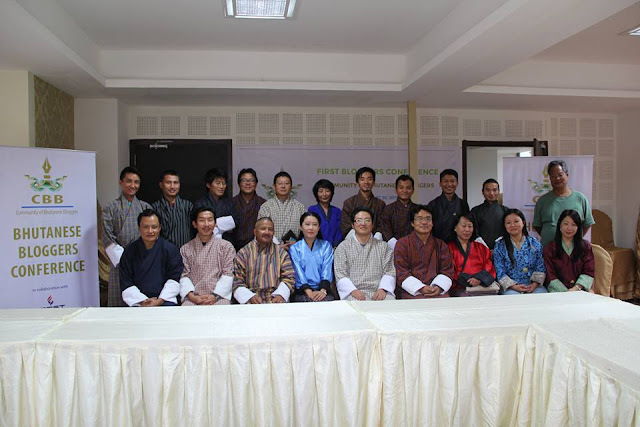 30 people attended the conference but eight of them had disappeared by the time we lined up for the photo session. 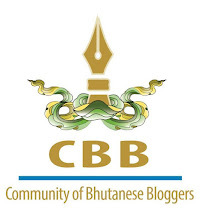 It was a good step taken by bloggers of Bhutan. Congratulations to all of you especially to you Passu and Ngawang Phuntsho. I really enjoy reading your ideas and wisdom. Please keep going ahead. Thank you for the post and everything. Your coverage is simply very captivating. Sir. ...... I have keen interest to write my opinions and findings. I didn't know how to join this community. Please help us. Why is it Between Chamkhar Chhu and Zhemgang?